There is a tendency in contemporary puppet theatre and in claymation to slaughter the dolls, without warning, in the final act. This is not an expression of nihilism nor the death drive. Rather, when matter is animated by lifelike emotions it reveals its maker is a puppet too, a machine that desires, and an imperfect one at that. Destruction, then, is the maker’s last tool to assert autonomy and affect transformation. 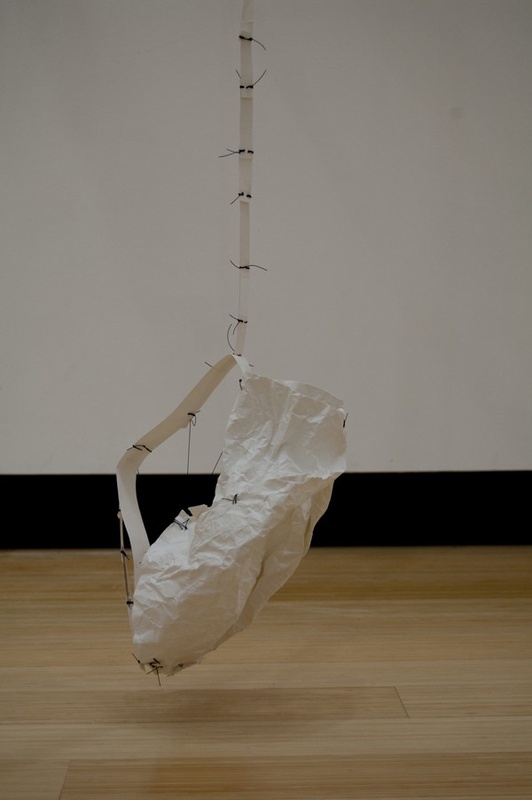 Judith Brotman’s sculptures manifest this selfsame narrative arc of struggle and its reversal. Her paper sculptures line the walls like a collection of monster skins shed after battle. The ancient Greeks decorated their temples with trophies of sacrifice and war—the teeth, bones, and skin of the dead—as garnish on their columns and pediments. Through the ages, these relics of violence have become transposed into the architectural cosmetics of Classicism. Brotman’s own incarnate architecture is constructed of pallid, stitched-up things that congregate at the room’s edges, the limping and healing remnants of former conflicts, the dancing slaves, the former selves, the sacrificial treasures and secret pleasures codified into a ritual and practiced as a rule. One does not mourn a shed skin, but adores it. If destruction is in-built, as promising as walls, then what of creation, invention, procreation, imagination? If we desire to fly we build elaborate prototypes; we do not jump off mountains. If we wish to divine omens we look deep inside ourselves; we do not slit open our own abdomens. If we are uplifted it is because we sit on an ever-growing pile of malignant golems and exhausted time machines, alchemical trinkets and spent erections. We are given matter but it needs to be awakened. If Brotman twists paper into a stick, maybe it will stand up. If she breaks it on purpose, it will take ownership of its wound. If she binds it with thread and wire, she’ll hold it all together.